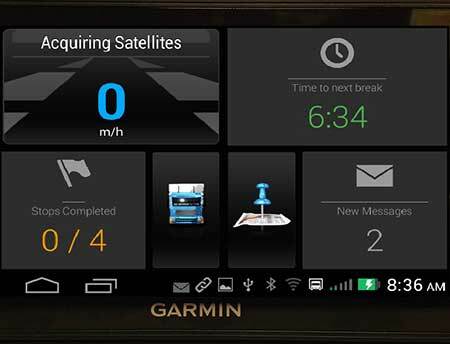 TransAm Trucking is pleased to announce that we are installing Garmin units in our fleet! What does that mean for you, our drivers? Not only do these Garmins have GPS components, but you can also use them to message your Driver/Business Manager, track your Hours of Service, and much more. With their sleek design and innovative features, these Garmins are a powerful tool to have while over the road. From start to finish, these Garmins keep you on track. Once dispatched on a load, the Garmin system automatically sends you turn-by-turn directions for each stop on your route. These directions are displayed in the Navigation widget in the upper-left corner. This widget also displays the posted speed limit and your current speed. If you exceed the posted speed limit, your speed will turn red, letting you know you need to slow down. Safety is important. It’s better to keep your eyes on the road than on your Garmin. This is why each Garmin is also equipped with voice navigation. Now you don’t need to worry about looking at a screen. The Garmin will vocalize your next turn, allowing you to keep your eyes on to road. The Stop widget is another handy feature. Found in the lower-left corner, it shows how many stops (fuel, unloading/loading sites, etc.) you will have along the route. It also tracks when a stop is completed, giving you a visual countdown to the end of the load. Time Management is a driver’s best friend. Another helpful Garmin tool is the Hours of Service Tracker. No more guessing how much time is left until your next break. The remaining time is displayed right on the home screen. If you want a more detailed breakdown of your hours, simply click on the Hours of Service widget. It displays your duty status and the amount of your 11-hour, 14-hour, and 70-hour time used. It also has an Hours of Service advisor. Everything you need right at your fingertips. Our drivers are part of the noble driving history. They travel the country to help keep America going. We hope this new Garmin system will make their trips a little easier. Thank you, Drivers! For more information on the Garmin system, please refer to your Handbook.